Description Since the 16th century, a figure blowing bubbles has served as an allegory for the vice of vanity. 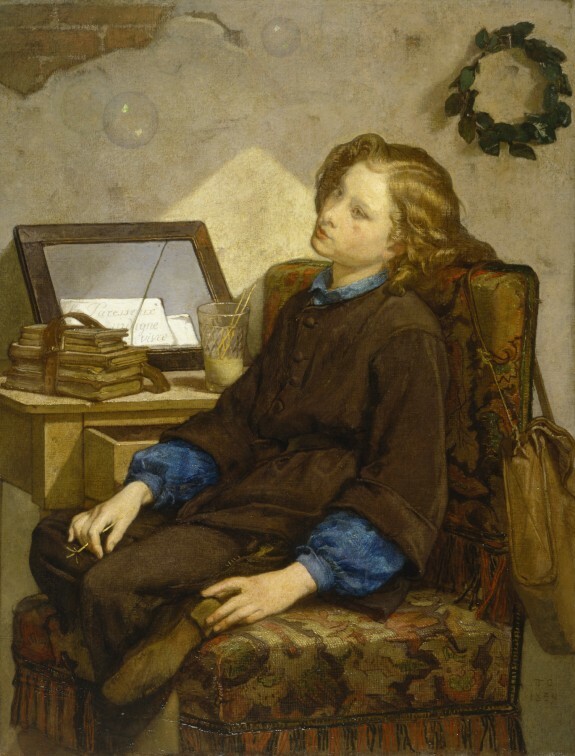 A schoolboy slouches on a chair beside his unopened books as bubbles drift overhead. The note tucked in the broken glass reads: "Le Parasseux indigne de vivre" (the lazy one unworthy of living). The soap bubbles and the crumbling wall suggest the fleeting nature of time, and the laurel wreath symbolizes glory ignored. Rejecting prevailing academic traditions, Couture developed a highly personal technique involving bright colors and expressive paint textures, which was based on his studies of Venetian works in the Louvre Museum. He frequently depicted contemporary subjects but filled them with moral overtones. An influential teacher, Couture trained such artists as Edouard Manet, Puvis de Chavannes, Mary Cassatt, and Eastman Johnson. Provenance Henry Probasco, Cincinnati [date and mode of acquisition unknown]; Henry Probasco Sale, American Art Association, New York, April 18, 1887, no. 45; William T. Walters, Baltimore, 1887, by purchase; Henry Walters, Baltimore, 1894, by inheritance; Walters Art Museum, 1931, by bequest.